When I see a chart in the New York Times that tries to tell me something that I know is demonstrably not true, I have to stand up and say something. And when I see other intelligent and insightful bloggers drawing inaccurate conclusions from this same chart, I doubly have to stand up and say something. 2) Healthy fruits and veggies are more expensive than ever. Ergo, we've got to do something about it... like raise taxes on soda. Here's the problem: both conclusions are fallacious. This chart is a textbook example of how authorities in the media can unethically render information to make any argument they want. It's up to us, as intelligent and critical consumers of information, to question the authority of our media and identify situations where our views and opinions might be subject to manipulation. And this chart, even though it supports an ideologically attractive conclusion, is an excellent example of manipulated information. Let me go over the various problems with this chart. First, inflation data is notoriously messy: The basket of goods that the CPI uses to compare prices changes regularly, and the CPI also assumes we cannot substitute goods (e.g., if beef becomes more expensive, we bias our purchases towards chicken). We also don't know to what extent the increased popularity of organic foods have skewed the past few years' worth of fruit and veggie prices to the upside, again complicating comparisons with soda or beer which saw no such secular trend. Further, year-over-year CPI data isn't daisy-chained together. Sure, you can compare this year's prices to last year's. You can, with slightly less accuracy, compare prices this year to prices five years ago. But when you start examining compounded price changes over ten or twenty years, comparability declines monstrously. Thus you can get into big trouble assuming that CPI data enables you to compare, with any accuracy, the compounding prices of two varying baskets of items (say, soda versus vegetables) over a 31-year period. Here's another question: what kind of average annual change would it require to cause vegetables over a 31-year period to increase 41% over inflation? Answer: approximately 1.01% per year. Over a data series this long, a 1% annual delta is almost guaranteed to be statistically insignificant, despite the fact that it looks nicely compelling when rendered graphically. In reality, the "vegetables" line on this chart likely tells us very little. An even bigger fallacy: the chart gives no starting prices, only relative price changes. If you want to compare the prices of two things over time, you must know the starting price. I'll illustrate with an extreme example. What if in 1978, in real terms, a beer cost $10 and lettuce cost $1 a head? Well, this chart would claim that today beer costs $8.50 (again, in real terms), and lettuce costs $1.41. Can we now conclude that lettuce is now much more expensive than beer? The relative change in these items has no meaning unless you tell us what they cost when you began your data series. By the way, let me know if you would like to add in a hedonic adjustment to account for the change of your 10c glass bottle of Coke into a cruddy $1.50 aluminum can. Whenever I'm reading an article and I see a compelling and highly counterintuitive chart like this, I try and recite to myself one of the oldest truths of the mass media: beware of charts--they tell particularly persuasive lies. I also try to ask myself a question that I've learned from reading The Last Psychiatrist (one of my favorite non-food blogs): What does the author want to be true? Well, after a critical read of the article, it's clear that this author wants you to believe that taxing soda is a wonderful idea. 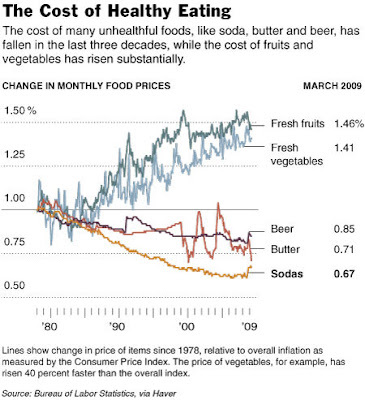 And naturally he's going to try and build an argument, complete with this persuasive-looking (and possibly data-mined, although I can't prove it) chart, to convince readers that healthy foods have increased in price dramatically compared to unhealthy foods, thus making it all sound so sensible that we right this wrong by taxing unhealthy foods. Of course, if you are a reader of Casual Kitchen (especially if you've read my essay Stacked Costs and Second Order Foods and are familiar with the many laughably cheap veggie-centered recipes here), you should see this chart for what it is: a falsehood, rendered graphically, to support a biased conclusion held by the author. Here's the ironic part: before I read this article, I would have leaned toward supporting a soda tax. But this article and this awful chart made me question the motives of this author, and by extension I'm now beginning to question the tax itself. After all, if the truth needs to be massaged to make a case for a soda tax, maybe it isn't such a good idea after all. This is such a great blog and a very interesting article, as I am always interested in how charts and statistics can be interpreted, but I can't resist saying that I grew up in the seventies and soda was nearly always in cans; bottles were just as rare as now, maybe rarer because the retro cool editions hadn't come out yet. I can't for the life of me remember how much it cost though, which is especially odd because I was obsessed with its cost (hence my need to post) but now almost never drink it. I was shocked to discover that out west they give you free refills of soda in restaurants!!! That's cheap. I don't know how I feel about the soda tax. Thanks for your insights on this issue in particular and in chart manipulation in general. I will be using a much more skeptical eye when reading charts in the future. I think I'm probably for the idea of a soda tax, but I totally understand why you'd think twice after feeling misled by their deceptive argument. I'm definitely against the proposed soda tax. We like soda. It's one of my few pleasures in life--a glass of Diet Coke or diet A&W Cream Soda. Love your analysis of the chart. It's true--you can make a graph or chart support anything you want. Any bureaucrat (or former) knows that! Nicely reasoned. You make some good points. I came over from a link in Cheap Healthy Good and will have to look around your blog. good article! you're right, that's a stupid and useless chart as are most. but please can you compare the change in a price of carrots to the change in a price of soda from a grocery store rather than from a vending machine.